Welcome to ParisEventTickets.com! With our vast selection of tickets to sightseeing, attractions, cabarets, and more we can help you plan your vacation and make the most of your time in Paris. Here you can quickly, easily, and securely book tickets to the Moulin Rouge or Lido de Paris. Enjoy lunch or dinner at the Eiffel Tower, a guided tour at the Louvre, a cruise down the Seine, or a visit to Versailles. Book your tickets here and see the best of Paris! Here you'll find all of our latest offers and special deals in the City of Light! We have many exclusive offers, so if you want to get the best price for the top tours and attractions in Paris, book your tickets here! Secure tickets in advance for this 3-part sightseeing tour by bus, boat and air in Paris. See all the highlights incl. the Eiffel Tower with skip the line! Great value! Experience Paris by night! The tour includes a visit to the Eiffel Tower, where you get to skip the long lines and take the elevator straight up, a scenic cruise on the Seine and a sightseeing tour by bus. It's fun for the whole family! 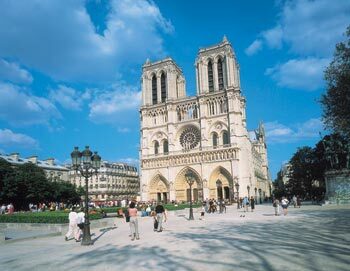 Book tickets to Paris Full Day, And see all of Paris incl. visit at the Louvre, Seine Cruise, Eiffel Tower & Notre Dame. Buy tickets to Paris Full Day here!